The official trailer for "Super Duper Alice Cooper", the upcoming documentary about the shock rocker's evolution from preacher's son to superstardom, can be seen below. The 97-minute retrospective on Alice Cooper is the latest release from Canadian documentarians Sam Dunn and Scot McFadyen of production company Banger Films ("Metal: A Headbangers Journey", "Rush: Beyond The Lighted Stage") and writer/director Reginald Harkema. "Super Duper Alice Cooper" is the twisted tale of a teenage Dr. Jekyll whose rock and roll Mr. Hyde almost kills him. It is the story of Vincent Furnier, preacher's son, who struck fear into the hearts of parents as Alice Cooper, the ultimate rock star of the bizarre. From the advent of Alice as frontman for a group of Phoenix freaks in the '60s to the hazy decadence of celebrity in the '70s to his triumphant comeback as '80s glam metal godfather, we will watch as Alice and Vincent battle for each other's souls. The film is the first-ever "doc opera" — a dizzying blend of documentary archive footage, animation and rock opera that will cement forever the legend of Alice Cooper. 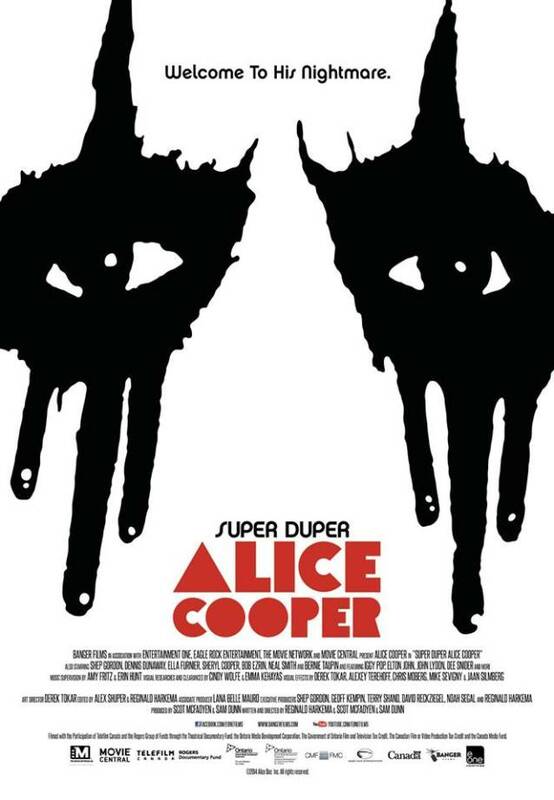 In a 2012 interview with Spinner.com, Dunn stated about the Cooper documentary: "We know Alice through various projects that we've done. We interviewed Alice for 'Headbanger's Journey'. He's also featured pretty prominently in two episodes of [the new groundbreaking documentary series] 'Metal Evolution', both in [the] Shock Rock and Early Metal U.S. [episodes]. He's a pretty fascinating character, who has been through a lot in his life. He's one of those musicians that maybe he hasn't had a hit in a long time, but everyone knows who Alice Cooper is because of his influence on pop culture and the big songs he had in the '70s. "We're exploring a different stylist approach with this film. It won't be talking heads; it's going to be more of an archival and animated journey through his career. "He's such a rich visual artist, it makes so much sense to try and do it in a different way. "I think we're just a little bit sick of doing talking head interviews, to be honest [laughs], after doing 300 of them for 'Metal Evolution'. So it's really the story of Alice's career from the '60s right up to the '80s and everything he went through — the ups and the downs, battles with alcoholism, being raised in a Christian family, rebelling against that but then coming back to faith later in his career, and moving from town to town, and trying to find his place." Alice Cooper's latest album, "Welcome 2 My Nightmare", sold 18,000 copies in the United States in its first week of release to debut at position No. 22 on The Billboard 200 chart. Cooper's previous CD, 2008's "Along Came A Spider", opened with just under 10,000 copies to land at No. 53. Recorded with longtime collaborator Bob Ezrin, who produced the original multi-platinum "Welcome To My Nightmare" album in 1975, "Welcome 2 My Nightmare" picks up right where they left off, with Alice trapped in his own warped mind.